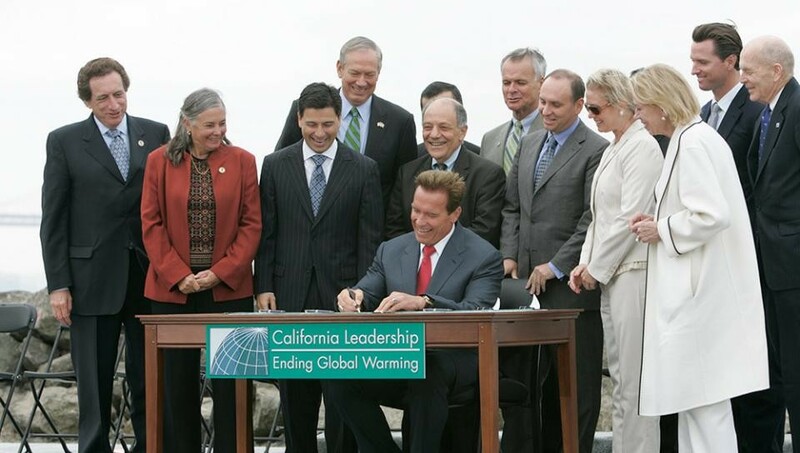 Governor Schwarzenegger’s lifelong love of the great outdoors carried into his leadership of California. The Governor fought to protect the beauty and natural resources of California, address climate change, support clean air, champion clean energy, and fight for the right of citizens to breathe clean air, drink clean water, and eat healthy food. The Schwarzenegger Institute is excited to announce a new partnership with “Political Climate,” a bipartisan podcast on energy and environmental issues in America. Last week, Professor Arnold Schwarzenegger spoke to a packed classroom of students taking the Schwarzenegger Institute’s class on AB 32. Last week, the Schwarzenegger Institute hosted Assistant Secretary of Defense for Indo-Pacific Security Affairs Randall Schriver for a series of conversations on his work in the Indo-Pacific region. On April 4th, the USC Schwarzenegger Institute, the USC Center for the Political Future, and the USC Wrigley Institute for Environmental Studies hosted the Climate Forward Conference. The USC Schwarzenegger Institute is pleased to welcome California Senate President pro Tempore Emeritus Kevin de León to the University of Southern California. Professor Adam Rose, accompanied by Professor Christian Grose and Conyers Davis, visited the California State Capitol on March 13th to provide a legislative briefing on his latest research. The USC Schwarzenegger Institute and the USC Center for Sustainability Solutions co-hosted with the Los Angeles Cleantech Incubator the leadership council discussion on federal carbon pricing policy. Environmental Policy Director, Senator Fran Pavley was a keynote speaker at the 15th annual California Water Law Symposium hosted at UC Hastings School of Law. Senator Pavley was the keynote speaker at the 2019 Citizen’s Climate Lobby (CCL) Southern California Regional Conference that took place at Cal State University of Los Angeles. Adam Rose, Ph.D. and Dan Wei, Ph.D assess the impacts of the Property Assessed Clean Energy (PACE) Program on the economies of California and Florida. Former California Governor Arnold Schwarzenegger, with the support of Fijian Prime Minister and COP23 President Frank Bainimarama, convened a Talanoa Dialogue on Oct. 25 in Los Angeles. In late October, Schwarzenegger Institute Environmental Policy Director and former Senator Fran Pavley attended the World Energy Press Conference. In July 2018, the National Caucus of Environmental Legislators (NCEL) hosted their annual National Issues Forum in Los Angeles, CA. Vice President Al Gore recently brought his Climate Reality Training program to Los Angeles, CA for a three day training. Thousands of lawmakers, business leaders, activists, scientists, and climate change enthusiasts descended upon San Francisco last month to participate in the Global Climate Action Summit (GCAS). With the help of the Schwarzenegger Institute's Digital Handbook and Senator Fran Pavley, Governor David Ige of Hawaii signed into law two very important bills to combat climate change. On May 15th Governor Arnold Schwarzenegger, Austrian President Alexander Van Der Bellen and Austrian Chancellor Sebastian Kurz hosted the second-annual R20 Austrian World Summit in Vienna. Following on the successful international agreement at COP 21, the UN hosted world leaders in Germany for COP 23, and continued to recognize the growing role and impact of subnational governments. At a speech at COP 23 Gov. Schwarzenegger encouraged environmental activists and international policy makers to devote more time, energy and attention to discussing the health impacts of pollution. Political, environmental and business leaders from across the State, came together on July 25, 2017 to celebrate the extension of California’s landmark cap-and-trade program. Dean Jack Knott and Schwarzenegger Institute Faculty Fellow Adam Rose participated in the recent Think 20 Global Solutions Summit in Berlin, May 29 and 30, 2017. Schwarzenegger Institute met with French President Emmanuel Macron at the Elysee Palace in Paris to discuss the future of the COP21 Paris Agreement and related environmental issues. On Friday, April 28th French President Francois Hollande presented Governor Schwarzenegger the highest honor in France- The Legion d’Honneur - for his environmental work. Institute Advisor and former Secretary of State George Shultz recently launched the Climate Leadership Council, and and have publicly advocated for a carbon tax. Institute observes the exercises to see first-hand the ways Marines are improving energy efficiency and using alternative energy to become a more effective fighting force. Institute hosted leaders across the state for a celebration in Sacramento to commemorate the 10th anniversary of the passage of the landmark bill AB32, the Global Warming Solutions Act. The Institute was proud to collaborate with Oberlin College for their three day conference "After Fossil Fuels - The New Economy." The Leonardo DiCaprio Foundation hosted its 3rd annual fundraising gala in St. Tropez and raised over $45 million. Gov. Schwarzenegger joined DiCaprio and auctioned off a few rare pieces. A survey of Californians likely to vote in the state's upcoming June 7 presidential primary examines the issues voters in CA consider most important when deciding whom to support for president. Institute director invited as special guest at European Union Consul Generals’ strategy meeting for a discussion regarding climate change issues. Read this update from COP 21 climate negotiations in Paris! WATCH THE LIVE WEBCAST of the climate leadership discussion during COP 21 with Arnold Schwarzenegger at Sciences Po University in Paris, on December 7, 2015 at 10:30am! Institute hosts Dr. Per Espen Stoknes, economist and organizational psychologist and Gary Gero, President of the Climate Action Reserve. Also, Bonnie Reiss participates in UC Carbon Neutrality conf. The Institute partnered with the R20 to host dozens of China’s CEO's and business leaders focused on growing their business while addressing climate change and environmental protection. In our unwavering battle against global climate change, we are fortunate to claim some of today’s most innovative and pioneering leaders as fighting on our team. Leaders of California gathered at an important symposium to review the various policies that have placed California at the forefront of addressing climate change. Arnold Teams with James Cameron and Jerry Weintraub as Executive Producers of "Years of Living Dangerously", a Showtime documentary series. On October 30th Governor Arnold Schwarzenegger was made an honorary forest ranger at a ceremony hosted by U.S. Forest Service Chief Tom Tidwell at the U.S. Department of Agriculture in Washington DC. Senate Majority Leader Harry Reid invited Governor Schwarzenegger to speak at Tuesday's 6th annual National Clean Energy Summit in Las Vegas. Former Governor Arnold Schwarzenegger met with Prime Minister Abdelmalek Sellal and other Algerian leaders to sign a three year agreement establishing an R20 office. Former Governor Arnold Schwarzenegger delivered the keynote speech at the 4th Annual Covenant of Mayors Ceremony which kicked off EU Sustainable Energy Week. Is “Zero Waste” In Our Future? Arnold Schwarzenegger and Terry Tamminen discuss Zero Waste. Governor Schwarzenegger addresses over 1,000 students in Vienna, as well as USC students via live webcast at the Vienna R20 Global Conference.